My garden’s first anemone, the sole survivor of 40 planted last year. 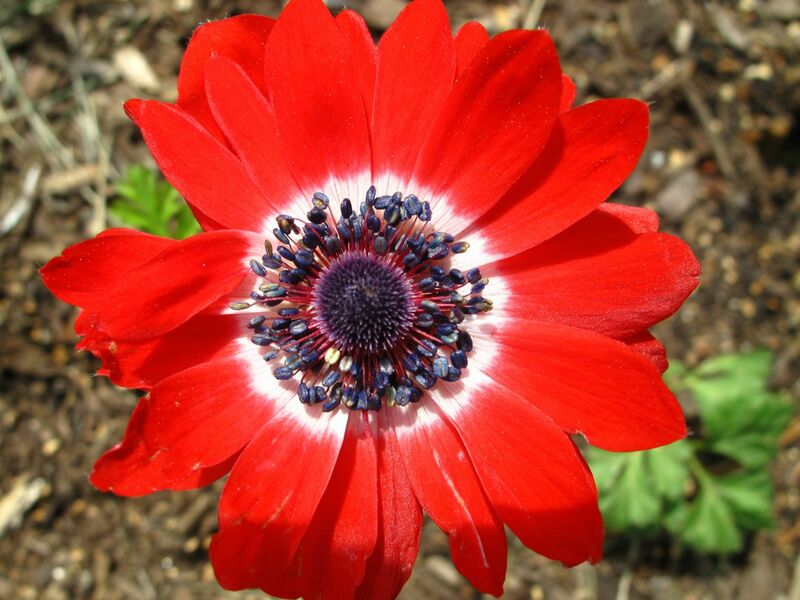 This is Anemone coronaria ‘Governor’ (Governor Double Poppy Anemone). I had envisioned a red border, but a spot of red is a starting point. This entry was posted in garden and tagged Anemone coronaria 'Governor', wordless wednesday on April 23, 2014 by pbmgarden. Love the name (Governor Double Poppy) for YOUR garden. What the heck happened to the other 39 plants? Funny but I hadn’t made the name association, Stepheny. I mail-ordered these for spring last year but they were very late being shipped. By the time they arrived it was hot and most of them never established at all. I’ll try again. Yes, I am asking the same! Hi Julie, didn’t mean to leave you hanging. I mail-ordered these for spring last year but they were very late being shipped. By the time they arrived it was too hot and most just fizzled. They shipped as corms, which I did presoak. I love these so will try them again. That is one gorgeous bloom you have there. Thanks Judy. I am thrilled to see it bloom at long-last. I love the flower but I’m sorry it’s the only one but that’s gardening. Happened to me with Fritillaria verticillata. We just keep trying!!! You’re so right Annette–try again. I’ll try anemones again but this time plant in fall rather than spring. As the name suggests it looks very much like a poppy in the middle – I love it! Did the others get eaten by something? I planted loads of mixed anemones last autumn and haven’t seen a single plant yet…. This one was among the mix I bought last year but I didn’t know the name as my supplier doesn’t sell this one singlely so thanks for the name. Glad I could pass along the name. I’m going to try a different source next fall. This happens to me with these lovely Anemones. I think they are gorgeous but I never seem to get the masses I plan. Just the odd tantalising few. I think I try them one more year, but your experience shows me I still may not get a big display. Oh, the blue and the white ones were what I really wanted and I added the red on a whim. None of the blue or white ones made it. I’m going to get some more in the fall. I am sorry for your losses, but your survivor is so gorgeous; something to be grateful for this spring. Hi Charlie. yes it was setback but this one success was so enjoyable. Do Anemones grow in your area?